I Want to be a Pinup! If you are on facebook, you can “like” the FanstRAvaganza page. 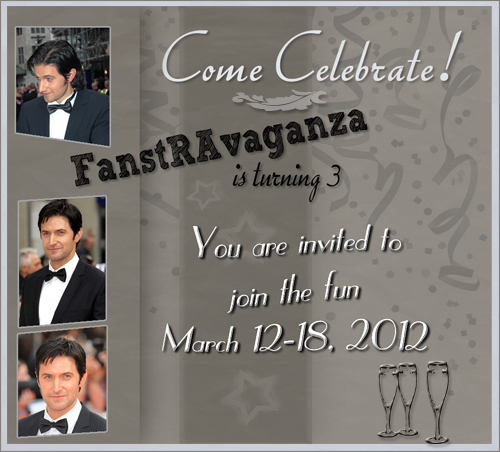 If you are on twitter, you can follow @FanstRAvaganza and the hashtag #FanstRA. Tomorrow, I will have a new post too! 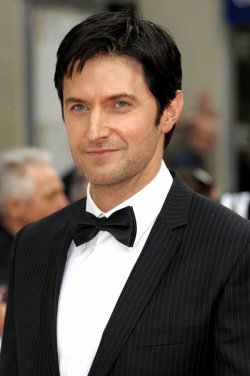 This entry was posted in richard armitage, Updates and tagged actor, fanstravaganza, richard armitage. Bookmark the permalink. 47 Responses to Counting down to FanstRAvanganza! By the way, who has the great idea to do this 3 years ago ? @April: You are again first with the comments, woohoo! I wonder how you do it. Do you read minds? Do you have ESP? *giggle* I’m looking forward to your participation. Sorry, but was it a ESP ? Regarding my question, I’ve juste seen that the founder of this event is Nat, is this right ? Yes, I do read minds or predict the future, lol lol lol. @gracie: I feel like dressing up, LOL! RA in a tux is reason enough to celebrate 🙂 Can’t wait to see what you come up with! A 3D hologram of Richard perhaps? Yay!!!! I love your elegant graphics in gray! Last year was my first FanstRAvanganza and bloggers were few, but I remember it was a very busy week. I felt my head spinning sometimes! This year the work is tougher (as an affectionate reader). I wonder how I could follow all these amazing activities! Fasten your seatbelts and….. don’t panic! LOL! @Carla: Thanks for noticing my new banner. 🙂 Yes, last year was quite a busy event. This year, not everyone will be posting daily which takes some of the load off, LOL! @Luciana: It’s really going to be a lot of fun. I hope you enjoy it. 🙂 I can’t wait to see what everyone is going to post too! Thanks for your kind words about the banner. RA is so beautiful it was a pleasure to make. A new banner! I’m excited! Thanks! @servetus: Yay, I’m super happy to be participating in FanstRAvaganza! I love the banner invite. I feel so formally invited. Shall we all wear our favorite gowns/suits when we read all the blog posts? Very elegant banner Bccmee. FanstRAvanganza! seems to be a great event. @Lady Prisca: Thanks! The banner came out a lot fancier than I expected, haha! @CDoart: Too true! RA makes me want to blog and that’s quite a feat, LOL! Looking forward to all the blogging! Thanks for the list of bloggers to check out. You know I will be looking forward to your surprises! Love the banner! CDoart’s index will come in handy. @Carolyn: It’s really going to be a blast. I’m looking forward to everyone’s participation in the form of blogposts as well comments! 😀 Yes, CDoart’s index is a real help! Looks like fun, love Richard in a tux, dashing and debonair, thud!! Oh, that photo in the middle..which you repeated at the bottom of your post….ooooooh. Now…. who were those crazy women who said a freshly clean-shaven look is less virile???? I just want to stroke Richard’s smooth cheeks before finding that vulnerable little bit of delicious white white flesh hidden behind the second button! Oh, yeah….. thanks for FanstRAvaganza, ladies! ROFL, your making me blush!! I’m with you in agreement all the way!! Actually I’d take him clean, dirty, long haired, short – I simply wouldn’t care!!! Shhhh…me, too. It’s just that I can’t resist stirring occasionally! Oh, I’m totally loving the beard! I’ve been trying to put it onto Guy – especially with clean series 3 hair – in my imagination! I have absolutely no idea how to manipulate photos except to crop or lighten them. Now…. if I had your talent, I could show you my favourite Richard face from my dreams! @kathryngaul: I’ve seen Guy with long stubble or a short beard. I tweeted a picture and asked if it was a beard or stubble and one of my online friends quipped that it was a cross between the two, or a “bubble,” LOL! Let me go look for the picture…. Thank you, thank you…I’d forgotten that photo! Now, I’ll use my imagination to thicken the beard just a tad…….mmmmmmmmmmmmmmm. I’m in heaven! That’s how Richard appears most often in my fantasies! I’m playing catch up on my blog reading. I love the silver gRAy F3 invitation! Perfect! Of course, the RA pictures aren’t bad either. Ha! @jeanniegisborne: Thanks for your kind words on the new banner. 🙂 I don’t think anyone is expected to read ALL the blogposts! I’m going to try but not sure if I’ll succeed, LOL! Thus herein I will be,with or wihout invitation! 😉 I can’t wat!